Puddles of Myself: A Second Look at "Second Wind"
Every May and June, it’s hard for any fan of the NBA not to think of Bill Russell. This is because the months of May and June encompass the thick of the NBA Playoffs and the NBA Finals. Bill Russell won eleven championships with the Boston Celtics; at one point, he and the team won eight in a row. When the stakes were the highest, Bill Russell always seemed to find a way to excel and succeed—whether through his own unique talents or by relying on and using the strengths of his teammates. I am a die-hard NBA fan. Off the top of my head, I can name the NBA champion for every season going back to 1959. Feel free to e-mail me and quiz me on random years. This spring, I’ve been thinking about Bill Russell for a few reasons that extend beyond the NBA Playoffs and Finals. In February, Bill Russell turned 79. For much of my life, I did not believe in the greatness of Bill Russell. I was raised and weaned on the transcendence of Michael Jordan, so I thought Russell’s achievements belonged to another, inferior era. However, as an NBA fan (and as an overall practical person), I had come to gradually appreciate Russell’s legacy. However, it wasn’t until this past March, when I read Second Wind, Bill Russell’s memoir, that I fully appreciated not only his mark as an athlete participating in my favorite sport, but also his mark as a human being. Second Wind was published in 1979, which was ten years after Russell retired from the NBA. 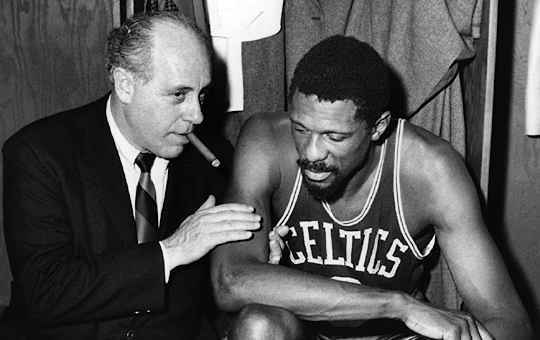 At the time, he had divorced and remarried, fathered three children and served four seasons as the head coach for the Seattle Supersonics (though he had been the player/coach for the Celtics from 1966-1969). He was forty-five years old and was willing and ready to reflect on his life. I prefer reading fiction to reading memoir (though I know that memoir can very often be as illuminating as the best novels), but I was amazed at how enlightening and entertaining Russell’s views on his life and life in general could be. Though the book is filled with plenty of basketball insight and war stories (for example, Russell on guarding Oscar Robertson: “When he hesitated near the foul line for the jump shot, I would take a step toward him, faking a move to block his shot or steal the ball. But what I really wanted him to do was to take the opening to drive by me for a lay-up, and I’d be able to recover in time to block the shot.”), it’s real merit comes when Russell meditates on the nature of life and all of it’s vices and virtues. This is indeed sound advice for not only another athlete but for a person in any profession. For me, as an aspiring writer in his late twenties working an office job, each day is a delicate balance of the vanity and ego that is necessary for creation, as well as an understanding of the perspectives and shortcomings of those in my office in order to do our best to work in some kind of productive harmony. Russell’s “starting points” work for young athletes and professionals and even aging alcoholics. In a country where we are still actively searching for equality in the right to marry (as well as fully accept a gay man who is active in the NBA), Russell’s points are all too salient. America still has a tendency to hide issues from its children, but, as Russell explains, that only leads to further ignorance. The best thing we can do for our children, for our youth, and, hell, even for ourselves is to encourage strength and independence so that each individual will be able to create his or own “starting point” for interpreting the world. Whether we may end up agreeing with it will be another story, but at least through strength and independence (and a little tact and class) it’s less likely to be born out of ignorance. So, as we head closer to June and closer to crowning this year’s NBA champion, I’ll have Bill Russell and Second Mind on my mind. Sure, I’ll appreciate his Hall of Fame observations on basketball and sports in general (“As much as I wanted to win that championship, I was disappointed the Lakers were not playing better. We were playing well enough to attain that special level, but we couldn’t do it without them.”); and his admissions that even after a career as a star athlete he still didn’t “know much about women.” Yet, what will stick with me most from his memoir, is the image of a proud, stubborn man who never stopped searching himself for the answers to help him better adapt and cope with the world in a healthy and meaningful way—mistakes, fits of anger and all. For me, seeing that image is like looking into a mirror. And, whether or not you are a sports fan or an athlete, I imagine you feel the same.